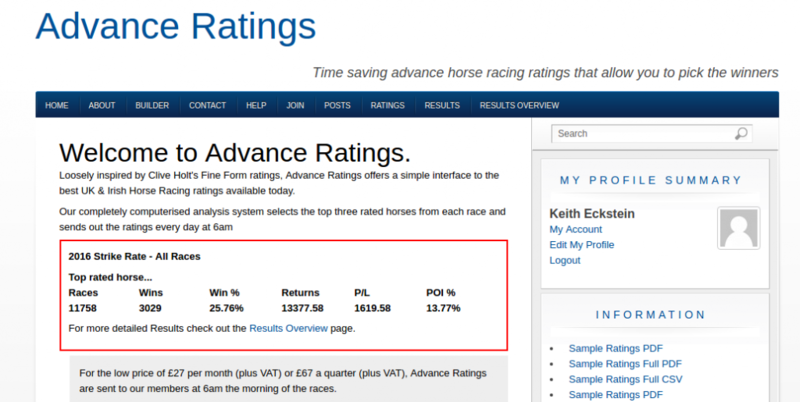 Advance Ratings is a modern, fully computerised ratings service that sends out accurate UK & Irish horse racing ratings at 6.00am every morning. You can also views the ratings (and download them) on the site. What Makes Advance Ratings Different? It is the only ratings service that is blindly profitable to ISP! That’s right, you could blindly back every top rated horse in every race and make a small, but useful, profit to level stakes to ISP. Now, no other Ratings Service can claim that. And, unlike some other famous ratings services, with Advance Ratings there is always only one top rated horse in each race. 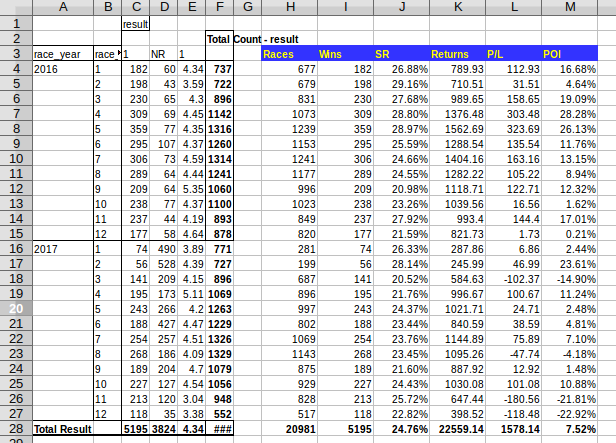 Every night spreadsheets are created that show the historical results of the ratings. The screenshot below shows the performance over the last 2 years. What If I Don’t Like Spreadsheets? No problem… There’s also a System Builder on the site and you can use its simple interface to design and test your own systems. Whilst the System Builder looks very simple, there’s a lot of power under the hood. You can drill down to give yourself access to more complex queries. 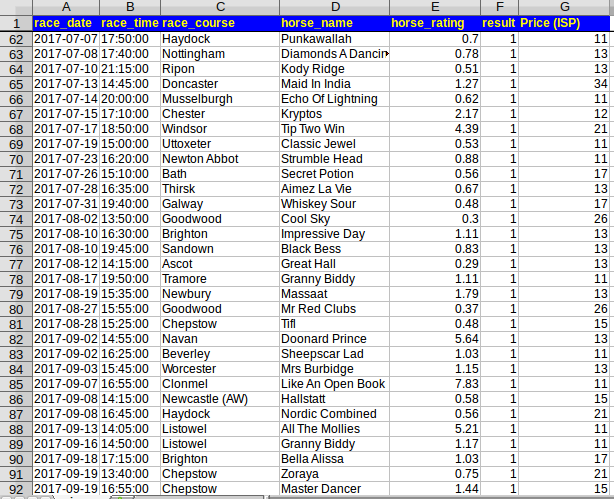 The screenshot below shows the results if you backed every top rated horse in All Weather Amateur races. 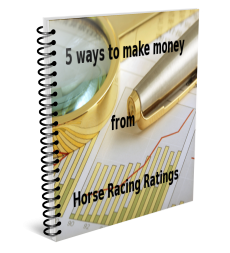 On the site there is an eBook showing you 5 Ways to make money from Horse Racing Ratings. Combined, these 5 Systems return a strike rate of 35% and a POI (profit on investment/stakes) of 35% to ISP. Not only that, the eBook guides you through the process of creating systems from the results spreadsheet. I like to think that I’ve got and excellent reputation for customer care. I am always prepared to help analyse your proposed systems and am happy to write code to run queries on my database for those systems that are too complex for the System Builder or spreadsheet to cope with. That can’t be tested on the System Builder but it’s a few minutes work for me to investigate and send you the results (with a summary) by email. As mentioned, I am passionate about customer care. That’s why I’ve decided to limit membership to the first 200 members so that I have time to help you design profitable systems. Although I have to say that it’s not too difficult to design profitable systems when the ratings are blindly profitable themselves. Because Advance Ratings is only focused on form, they sometimes bring in high priced winners. 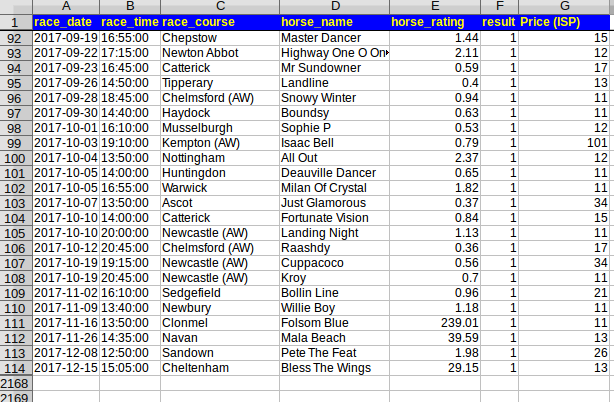 On Friday 15th December, in the 3:05pm at Cheltenham the ratings got the first 3 horses (in the right order.) The winner paid 12/1 and the Trifecta paid £328.20. They paid a total of £30.01 to £22 in stakes. This equates to a POI (profit on investment/stakes) of 172.77%. Advance Ratings is ideal for Dutchers. On Tuesday 12th December, 6 of the 8 races (many meetings were abandoned) were won by a top three rated horse. The same goes for Layers. 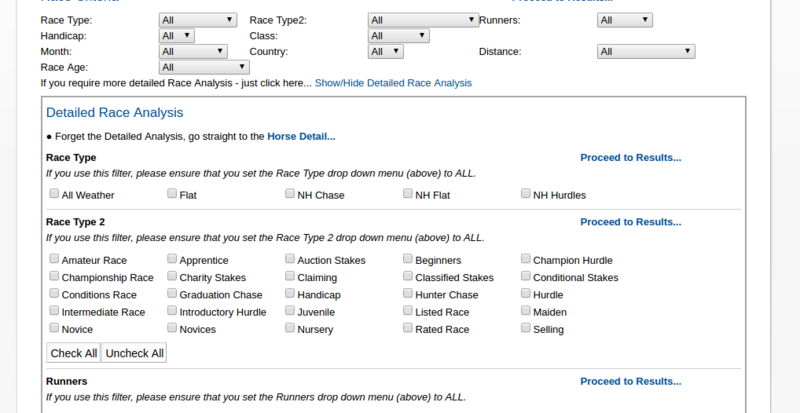 Why lay any of the top three rated horses when it is likely that one of them will win. Advance Ratings is blindly profitable to ISP. On Monday 11th December we had a 46.15% strike rate and, to level stakes to ISP, the POI was 16.45%. 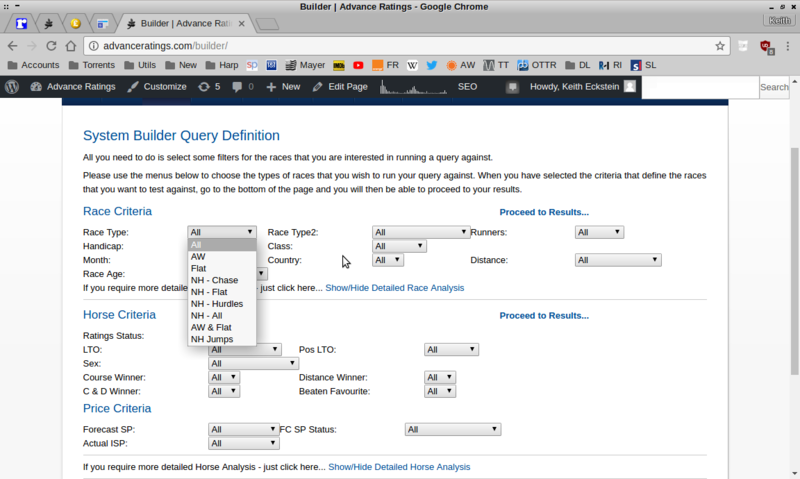 Advance Ratings has a System Builder. This allows you to test and create profitable systems and have any selections emailed to you every day at about 6.00am. Thus, allowing you to get on the early prices. You get the first month for half price. You read correctly to test drive this for a whole month you will only pay £13.50! The ratings come out at 6.00am every morning. This allows you to get on the early prices. From January 1st 2018 the ratings will be coming out at 6.00 pm the evening before the day of the racing. The ratings come with a free eBook containing 5 systems that have, historically, generated a 35% strike rate and a 35% profit on stakes to ISP. Advance Ratings is a joy for those of you who like systems. But then, it’s not hard to create a profitable system when you are starting out with ratings that are blindly profitable. 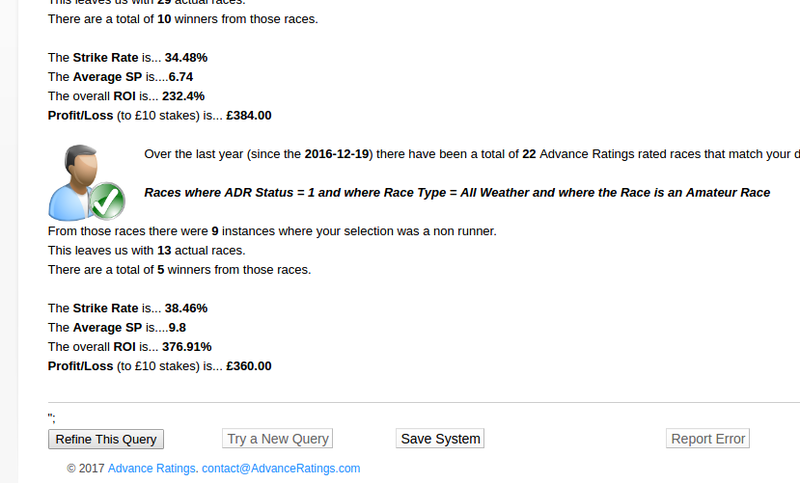 Advance Ratings is the only ratings service that is blindly profitable to level stakes to ISP. No other UK & Irish ratings service can claim that. You need a ratings service to help you validate any Tipsters tips that you receive. If that tip isn’t a top three rated horse, consider it very carefully. If that tip is top rated on Advance Ratings, think about doubling your stakes. Spend a month paper trading this strategy and see how much it improves your profits. Be one of the lucky ones who are part of a very special club; subscribers to the only ratings service that is blindly profitable to level stake to ISP. For a monthly payment of just £27.00 (plus VAT) you can use the service to narrow the field so that you can concentrate on the real contenders…. For a quarterly payment of just £67.00 (plus VAT) you can use the service to narrow the field so that you can concentrate on the real contenders…. It brings in plenty of high priced winners. 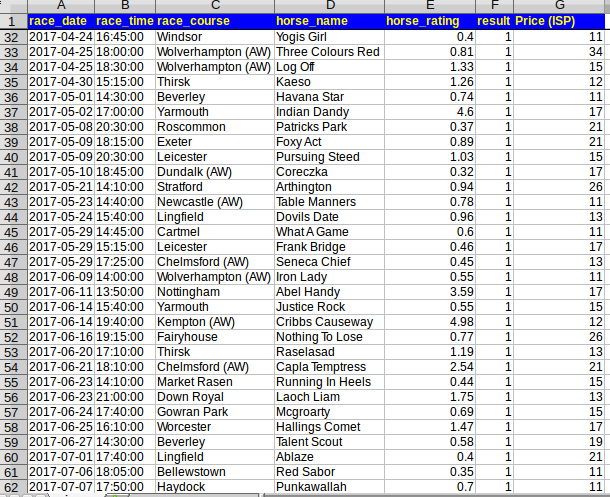 So far this year, there have been 433 top rated winners that paid 5/1 or more. 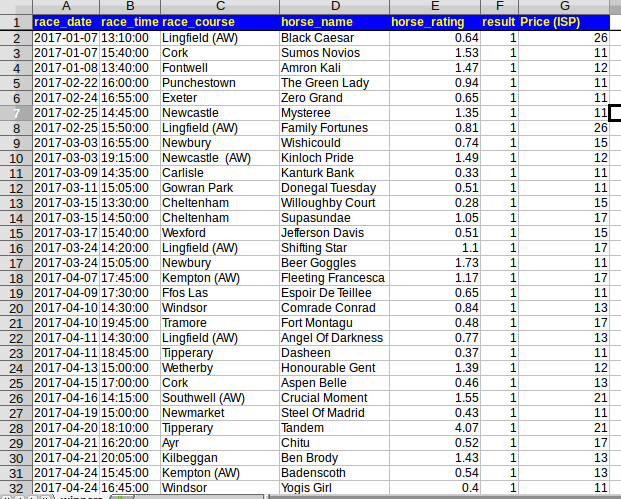 There have been 8 top rated winners that have paid 10/1 or better in the last 2 months. You’d have only needed to have had a £3 bet on Issac Bell in the 19:10 at Kempton on the 3rd October to win enough to pay a years subscription! It paid 379.57 to BSP! A £1 stake on the 2 high priced winners so far this month would pay a month’s subscription and still have enough left over for a take away Pizza. IMPORTANT – Only 200 places are being made available and the HALF PRICE first month offer maybe removed at anytime so please act fast if you want to be part of this totally unique club!